I thought I would begin my blog by talking about the much forgotten tool of the letter writer, the letter opener. Not many people I know, other than those of us who write regularly, even use a letter opener. Perhaps it doesn't matter if the envelope of a bill is mangled when it's opened. Some junk probably doesn't even warrant opening. The letter opener, or paper knife as some call it, was an indispensable implement when sending mail was the principle form of communication. Today it's more of a collectable item than a useful one. It's evolved over the decades from understated little knives to plastic and novelty offerings and at the other end of the spectrum there are electronic letter openers for businesses with windfalls of correspondence to open. Do you use a letter opener to open your correspondence, or do you just tear into your letter finger first? I use a letter opener mainly because it doesn't ruin the stamps or the envelope and I like saving them both. We have a few letter openers that were gifts, but we don't really use them. Frankly, most of them don't work and make a mess of the envelope, rather than slitting cleanly. We've always just used an old knife. I know that sounds odd, but this particular knife has sentimental value. It's more than 70 years old and belonged to my late Mother-in-law. It came from her home in the Dutch East Indies where she grew up. 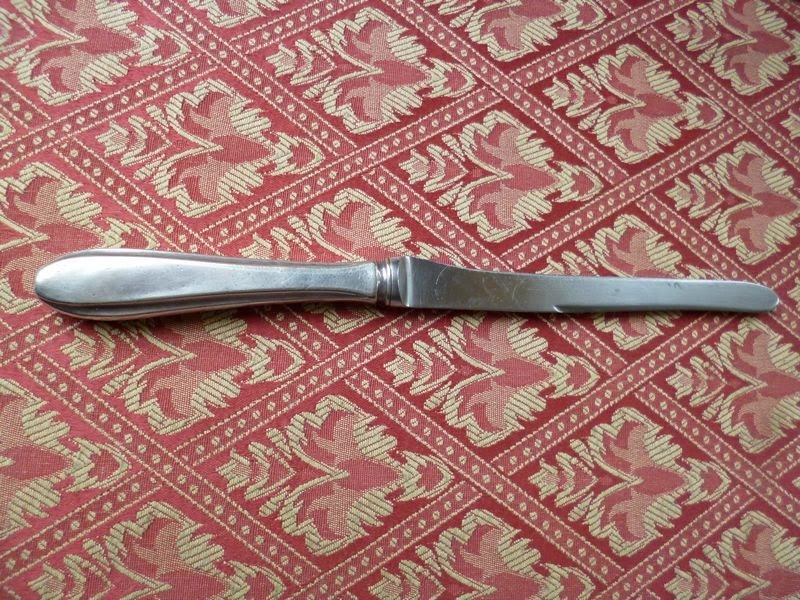 It doesn't sound like the typical family heirloom, yet this solitary knife and it's matching fork went with her the day her family was taken prisoner by the Japanese during WWII. The knife is old and well worn; it's scratched and not very sharp any more, but still we use it daily. I think of Johanna often when I use the knife. She endured disease and starvation and was near death when liberation finally came. This knife is a poignant symbol of her survival. For us the knife personifies her endurance, and we use it as a remembrance of her courage and the joy with which she embraced life after such a damaging experience. I think it is a fitting tribute to Johanna, that we use the the knife as a letter opener to read the happy news our friends send us by post. Had I known it was possible, I would have left my comments here instead. I have morgues filled with such facts. You make it more personal and interesting. This is lovely. I want to hear more about Johanna. Johanna had a colourful life. She met Mr. B as a result of her time at the camp. That is a love story for another time, though. I am hanging on your cliff! Johanna deserves a biography. There actually was a book written about the war camps at the time she was a prisoner. Some of the things Johanna had, art from friends, a portrait and that sort of thing are in the book. We still have one of her red cross boxes.